This isn’t actually a picture of my exhaust, but all rusted up, it could’ve been, had I’d been able to crawl under the car to take the photo. 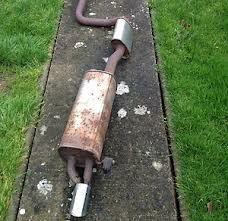 It was my neighbour who asked me how long my exhaust had sounded like that. Sounded like what? I’d not noticed anything amiss driving around with the radio on & my windows closed. As I do a fair amount of driving to clients & meetings & on the motorway too, I wanted to get it fixed sooner rather than later. Well, the best laid plans were disrupted by snow, then I was panicking that driving over all the drifts would catch & pull it off. So at the first opportunity today, I took it to the dealer. He asked whether I was sitting down when he phoned a short while later. Three replacement parts were required! I had no choice, the work needed doing, so I gave my authorisation.